The Spitfire Scout transportable scooter combines easy and convenient mobility with superior value. The Spitfire Scout is compact, lightweight and easy to disassemble-perfect for taking wherever you want to go, either around the neighborhood or far from home. 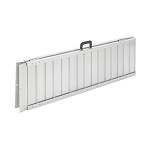 It can be disassembled quickly and easily into five easy-to-handle pieces for loading into a car, truck, or van and taking shopping or on vacation. The three-wheel version of the Spitfire Scout allows for nimbly negotiating indoor obstacles. 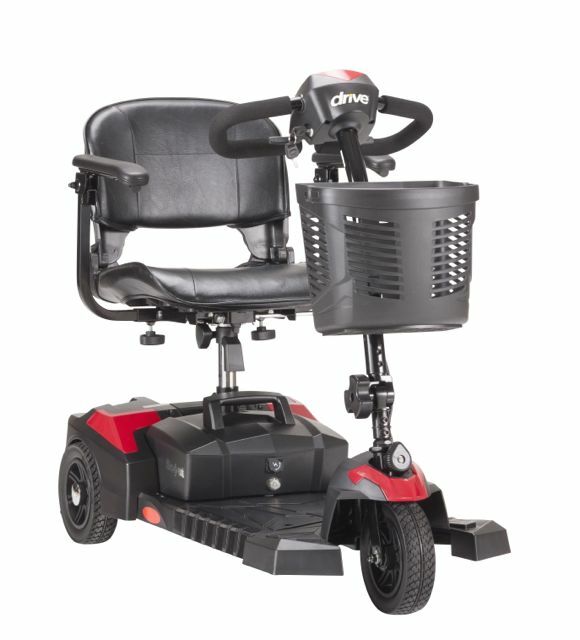 The Scout also offers great features like a quick connect battery pack and a delta-style tiller to make operating the scooter easier for those with limited strength or dexterity. 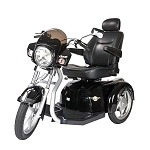 This model comes with color-through panels to hide scuffs and scratches and black wheel rims. 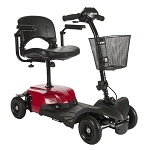 Actual Product Weight: 85 lbs; Anti Tip Wheels: Yes; Base Weight: 49 lbs; Batteries: 2 - 12V 12AH; Battery Weight: 20 lbs; Brakes: Electromagnetic; Charger: Offboard, 2A; Climbing Angle: 6 degrees; Controller: CTE 45A; Front Wheels: 8" x 2" Flat Free; Ground Clearance: 2.5"; Heaviest Piece: 29 lbs; Max Speed: 4.25 mph; Maximum Range: 9 miles; Motor: 24V x 270W x 4700rpm; Number of Wheels: 3; Overall Product Height: 35"; Overall Product Length: 42.5"; Overall Product Width: 20.5"; Primary Product Color: Red; Primary Product Material: Steel; Product Weight Capacity: 300 lbs; Rear Wheels: 8" x 2" Flat Free; Seat Depth: 16"; Seat Weight: 16 lbs; Seat Width: 16.5"; Seat to Floor Height: 17"-19"; Turning Radius: 45.5"